Home > Daily News > What’s Better Than A Big Party?…A Party With A BIG Bottle of Wine! What’s Better Than A Big Party?…A Party With A BIG Bottle of Wine! This coming Friday (29th March) is the best marine industry networking party of the year! Don’t miss out! 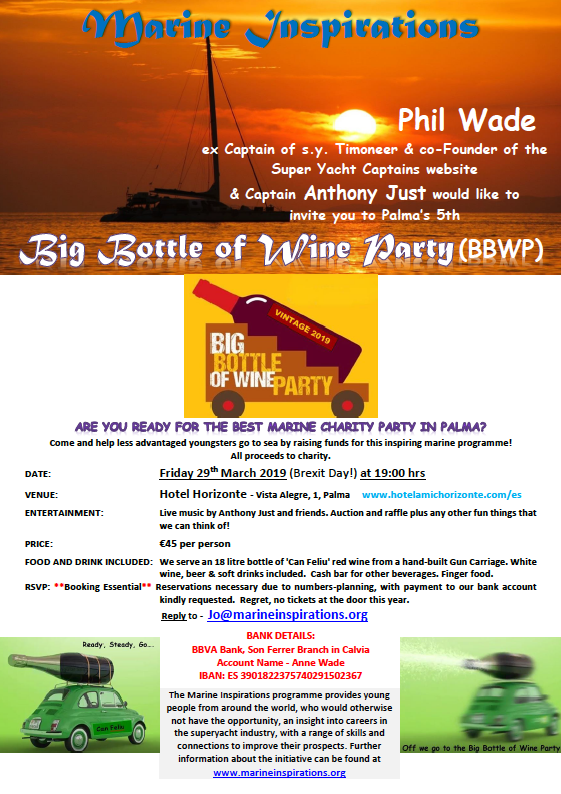 The party is called the Big Bottle of Wine Party (BBWP) because we open an expensive 18 liter bottle of red wine kindly donated by Can Feliu Winery in Porreres, here in Mallorca. When this is finished we open another one and so the party goes. White wine, beer and soft drinks also included. The party is held annually in aid of Marine Inspirations charity (www.marineinspirations.org) which helps under privileged youngsters aspiring to a career at sea. This year the venue is the Hotel Horizonte, just above Porto Pi overlooking the harbour with spectacular views. The party starts at 19.00hrs 0n Friday 29th March, live music and plenty to eat and drink, all included for 45 euros per person. Tickets must be pre-booked and will not be available at the door, so if you are thinking of coming please reply before Wednesday which is our cut off date. This is the 5th year in a row and it is a very well known event which gets lots of publicity so you may already have heard about it. A lot of FUN!!! Spread the word to friends and colleagues and hope to see you there!